I never had an interest in the Phantom Stranger before this current series, but it's surely piqued my interest for the Phantom Stranger in the future. 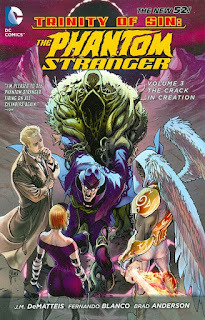 Trinity of Sin: The Phantom Stranger Vol 3: The Crack in Creation concludes this title, and it's the weakest of the three volumes solely in its haste to wrap things up and also the significant portion of this book given over to the Forever Evil: Blight crossover. However, Dan DiDio and J. M. DeMatteis's Phantom Stranger has been smart, literate, and thoughtful, giving the Stranger more emotional depth than I would have imagined, and the book's relation to the maligned New 52 "Trinity of Sin" should not dissuade readers from trying it. Crack in Creation opens similar to earlier stories; the Stranger has chosen again to defy God and do what he believes is right, even faced with cosmic annihilation -- and awakens to find that God (in the form of a Scottish Terrier) approves. It's the same in the end, when the Stranger agrees to eternity in a personal hell to save his lifelong guardian angel Zauriel -- and again, the Stranger's willingness is enough to spare them both. Phantom Stranger started out with the idea that the Stranger was cursed to wander the earth by a vengeful, demanding God, but time and again that God manifests as more understanding than the Stranger believes. The reader catches on that what drives the Stranger is not God's punishment, but his own guilt, and the Stranger finds redemption when he finally forgives himself. This is what sticks with me about Phantom Stranger, that it's a book that, set against a specific religious backdrop, often works to foil the reader's expectations. The Stranger is posited here as Judas Iscariot (heavily hinted, but DiDio's finally allowed to say so in the Futures End tie-in) and so it's conceivable he's been cursed by God to walk the earth, but that turns out not to be the case. Terence Thirteen, at one point an antagonist, emerges as the Stranger's best friend, and side character Chris Esperanza becomes the Spirit of Redemption. The Stranger's arch-nemesis Sin Eater murdered his own family, but later gives them a proper burial, and the Stranger takes pity and shows the Sin Eater mercy. Through the three books, DiDio and DeMatteis chart the Stranger's distinct path of growing self-awareness and independence, which unfolds for the reader along for the journey. This third volume collects twelve issues, #12-22 and the Futures End tie-in. Of the regular-series issues, the first two are "independent" (leading into Blight), the next four are Blight crossovers, and then the book ends with the three-part "Crack in Creation" and a two-part finale. Though the book's quality is generally good, strongest are the first two issues, with DeMatteis and artist Fernando Blanco on their own in stories that involve the Sin Eater and the Question, before the book is swept up in Blight and concluding. DeMatteis and Ray Fawkes's Blight is mostly John Constantine's story, but the important elements (the identity of the evil Blight himself) stem from Phantom Stranger; someone really interested in Blight would want to read Stranger volumes 1 and 2. The book joins Blight a few issues in, but there's enough connective tissue between issues #13 and #14 that the beginning feels natural. The later issues have jumps in the action that only other parts of Blight can fill in; most problematic is that the culmination of Blight (in which Chris becomes the Spirit of Redemption) takes place in a different series entirely. I liked, in the first volume, Phantom Stranger's sudden weird turn to the Stranger playing Vegas poker with Trigon's sons. A strength of this "mystical" title is that the landscape is fluid, and the Stranger can as much come to blows with a villain as to fight a virtual battle inside John Constantine's head. In Blight, there's a couple issues like that, including where the Stranger ventures back to Vegas, enjoyable from the standpoint of the Stranger series but that felt like filler in the Blight crossover. As well, in the finale, I thought the hidden city of fallen angels that DeMatteis creates in the Utah desert was interesting, but the idea that the Stranger has to fight a horde of evil angels to resurrect the late Zauriel -- basically just because magic says so -- seemed a too nonsensical on-the-spot creation. There's an odd moment late in the book where the Stranger refuses to save Zauriel's life; the Stranger later reconsiders, but states that "what disturbs me even more (and I'm ashamed to admit this, even to myself), is the idea that this angel, this man ... loved me" (emphasis in the book). I read this at first, rather surprised, as a suggestion of the Stranger's homophobia. This would be weird, but if DeMatteis imagines the Stranger coming from Biblical times, maybe not so far-fetched; I dismissed it, though, as the Stranger simply being unable to accept Zauriel's love given all the Stranger's sins. But, I did note that DeMatteis resurrects Zauriel as a woman, and I wondered if with more time DeMatteis meant to explore the Stranger's beliefs about gender and sexuality through his interactions with Zauriel. Artist Fernando Blanco is Phantom Stranger's MVP, giving the book a gritty-yet-animated detail that, like Aco on Constantine, emerges somewhere amidst Michael Lark, Frank Quitely, and Doug Mahnke. It's also nice to see Norm Breyfogle, drawing in a more rounded style than his Batman work that dovetails with Blanco. The only sore spot is Blanco's depiction of magician Cassandra Craft; Blanco's art has no hint of sexual gratuity until he draws Craft consistently and incongruously with her shirt undone almost to her belly button (Breyfogle, in the same scene, gives her an undershirt). DeMatteis, too, struggles with Craft, introduced as the Stranger's soulmate but who exits before the conclusion and is never mentioned again. Who can say when DeMatteis knew the end was nigh, but it might have been better for him not to have introduced Craft at all. Dark Universe seems to have stalled at DC, but coming off Trinity of Sin: The Phantom Stranger Vol 3: The Crack in Creation and my Blight reading bonanza, I'm eager to see a new teaming of DC Comics's mystic characters, and what new writers do with Dan DiDio and J. M. DeMatteis's New 52 Phantom Stranger. I think DeMatteis's Trinity of Sin series came and went so fast that most people missed it, but I'm curious to check it out and see his last word on these characters. This title was largely underrated. It's too bad the series didnt have the fan base needed to continue, or wasn't aggressively marketed. Also sad to see something of a quality drop as the title scrambled to close up shop, but that's an unfortunate reality of the business we've seen time and again -- I, Vampire being the first example among many that comes to mind.